Alcatel Drops The Prices Of Several Smartphone And Gadgets! 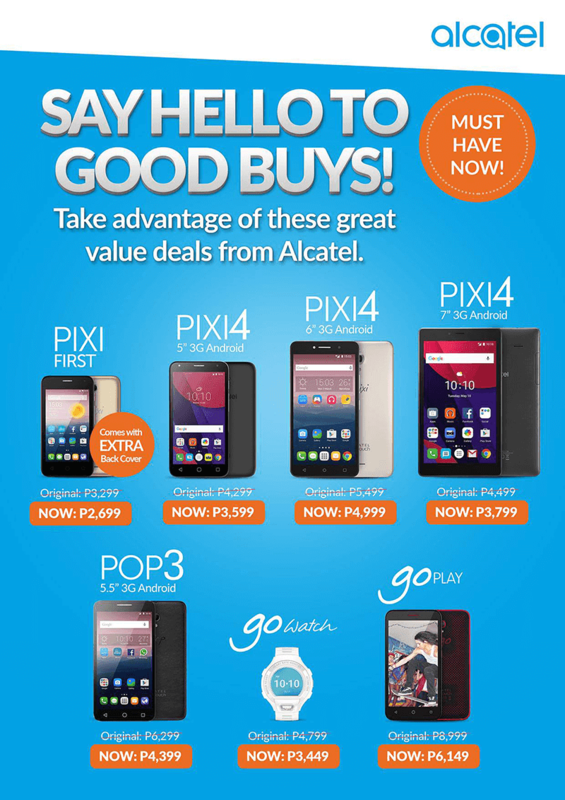 Home / alcatel / mobile / news / Alcatel Drops The Prices Of Several Smartphone And Gadgets! Alcatel Philippines has announced on their official Facebook page that they just dropped the price of their several smartphones and gadgets. It includes the entry level Pixi First, Pixi 4 line (5, 6, and 7 inch models), Pop 3, Go Watch, and the rugged Go Play. The Pixi First originally priced at 3,299 can now be purchased for just 2,699 Pesos. It'll also come with a FREE extra back cover case. Then Pixi 4 with 5 inch screen priced at 4,299 is now available for 3,599 Pesos, the Pixi 4 with 6 inch screen at 5,499 before is now at just 4,999 Pesos, and the Pixi 4 7 inch tablet from 4,499 is now priced at 3,799 Pesos. On the other hand from 4,799, the Go Watch is down to 3,499 Pesos. Lastly, the Go Play from 8,999 got a great price drop now at just 6,149 Pesos.